Content marketing, we’re told every day in every way, can yield positive results for any business or organization…if it’s done right. But, what’s right? This article offers 9 key, specific suggestions to improve and maintain content quality that are tailored to the needs of small to medium-sized businesses and organizations. It’s now a cliche that the internet continues to revolutionize human communications, including the way marketers ply their craft. But, as countless writers over the centuries — from William Shakespeare to Aldous Huxley and beyond — have pointed out, whenever we find ourselves traveling through a Brave New World, our survival and our success will be dependent on not losing sight of the lessons of the past. Aaron Agius, co-founder and Managing Director of the Sidney-based internet marketing agency Louder Online, notes some of those valuable “old world” lessons today’s online marketers can learn from studying the methods employed by old-school, print journalists. 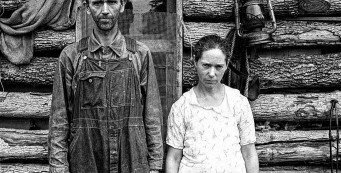 In “9 Lessons Content Marketers Can Learn from Traditional Journalism,” Agius offers some insights into those traditional techniques and some examples of their potential to attract and win audiences online. As part of AUMW’s ongoing effort to provide and disseminate useful, valuable information about Content Marketing, we are constantly running across articles that stimulate our thinking. 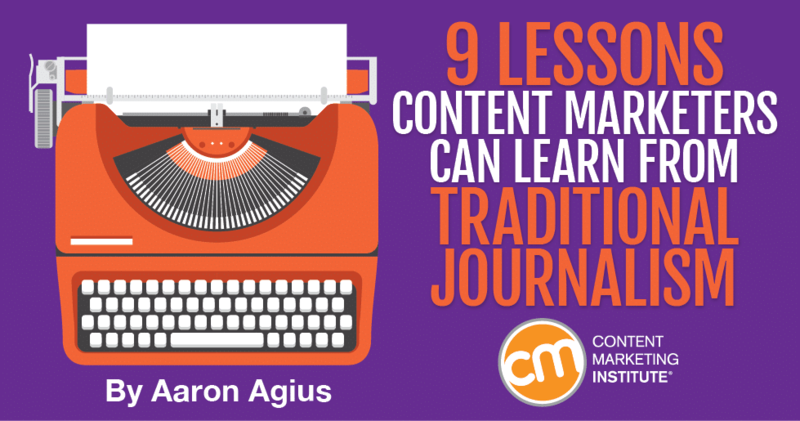 This post is inspired by an article by Aaron Agius on ContentMarketingInstitute.com: 9 Lessons Content Marketers Can Learn from Traditional Journalism. Agius argues that, while headlines with strong SEO signals are important for online marketers, they must be incorporated into headlines that serve two essential purposes — capturing attention and conveying information. He urges striving for headlines that create a sense of timeliness and urgency, and he offers three before-and-after examples of the type of headline he’s advocating. Turning to click-bait, Agius notes that Facebook recently issued a specific policy against click-bait headlines. He doesn’t say, but could, that search engines are continually downgrading the SEO value of what he calls “spammy” headlines. Pay attention to your comments section (and I’d add customer questions). Focus on what readers are telling you, and respond to them with questions that will help you understand their interests and concerns. Use one or more of the readily available analytics tools — like Google Analytics or the tools offered by your social media — applying them to both your current and past content offerings. Review your secondary source material independently. Contact sources directly, whenever practical. Consider doing primary research on selected topics. Agius says, “Traditional journalists make it a point to create timeless content…” He continues, addressing content marketers, “Covering current events in your industry is certainly important, but you’ll want to balance this with evergreen content to meet your audience’s needs.” While much of Agius’s advice here is beyond the reach of any organization without deep marketing pockets, the principle is not. Agius points out, “Newspaper formats allow traditional journalists to minimize distractions because they can present only one or two pages at a time. Content marketers, on the other hand, must contend with multiple points of entry in a single view – banner ads, related post links, calls to action, etc., that all prompt viewers to leave the page they’re reading.” Or, I’d add, simply to lose their focus and wander away from your message, figuratively or literally. His recommended response: cautious consideration and restraint when introducing “unnecessary distractions that could steal readers’ attention…” Among these potential distractions, he includes web sign-up forms, flashy banner advertisements, email subscription boxes, multiple images, and links to internal or external content pieces. He argues that content marketers should embrace that value, which often means the willingness to avoid — or at least acknowledge — bias when discussing your own products and services, as well as those of your competitors. While doing so may be counterintuitive, an overtly biased approach will likely prove counterproductive. Producing quality content is crucial to building, maintaining, and motivating your audience. While there’s no consensus on how to define “quality,” one clear characteristic is carefully edited copy. And, much as we may be tempted to short-cut, running spell-check is not editing. 9. Don’t bury your lead. Learn and practice the inverted pyramid style of writing. Coming soon: I’ll tackle each of these last two lessons, delving into them in separate articles. Meanwhile, keep Agius’s advice in mind. While creating and publishing successful marketing content — content that separates us from the clamoring crowd — we don’t have to reinvent every wheel. There’s plenty to be learned from successful writers in other fields who’ve learned how to win and hold readers. Robert is co-owner of And Update My Website, an internet content marketing agency, and is the company's Editorial Director. He's a seasoned writer and editor of both online and print marketing materials, website content, promotional materials, video and audio scripts, user manuals, press releases, grant applications and reports, and scholarly papers. Examples include: writing content for Hewlett Packard, explaining HP technology to technical and consumer audiences; editing, publishing, and writing content for a 36-page monthly community newspaper; more than two dozen grant applications with a 100% success rate; web content for Willamette STAGE Company (www.willamettestage.org), where he is the founding Artistic Director. Five proactive, high-priority steps for nonprofits to negotiate and manage the changing face of Facebook marketing.